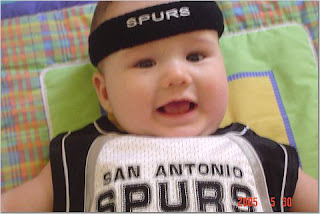 I will cheer for the Spurs now that they beat the Suns, but ONLY because baby Jackson was born there, and one of his friends from school has an uncle on the Spurs, so it is kind of hard not to now!!! I don't care, you're a traitor! Here goes nothing. . .